This continues our week of Memorial Day-appropriate recipes that are easy, delicious, and don’t involve you slaving away inside! These are, like, the EASIEST. AND you mainly make them ahead! 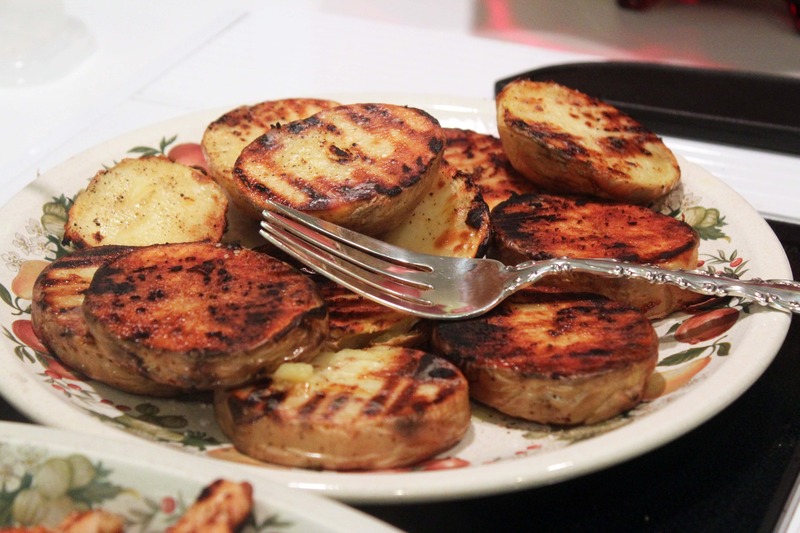 These yummy potatoes are so simple: you half bake the potatoes in advance, slice them, grill them, and eat them! Sheesh. That’s only four things! 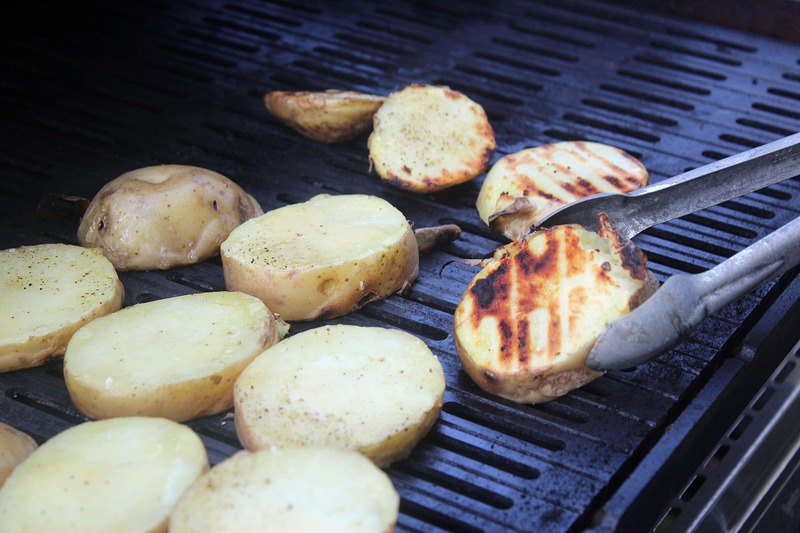 I cook the potatoes partially before grilling them to be sure that they are nice and tender, and to save some grilling time. I use the microwave for that particular step, and cook them until the potatoes are soft on the outside but not tender all the way through, about 2/3 of the time it would take to fully cook them. Scrub the potatoes, prick them with a fork, and nuke ’em for 10-15 minutes. This can be done DAYS in advance! 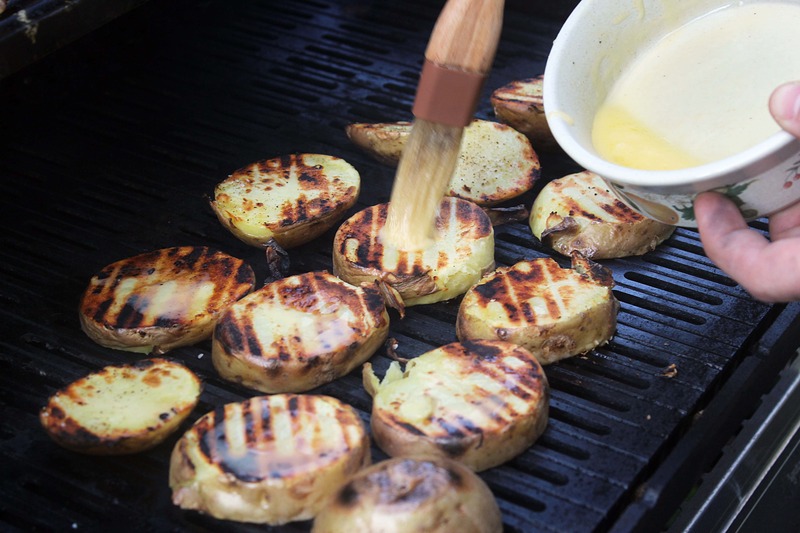 When you’re ready to grill, cut the potatoes into thick slices, or in half if you’re using baby potatoes. Then, sprinkle them liberally with salt and pepper. 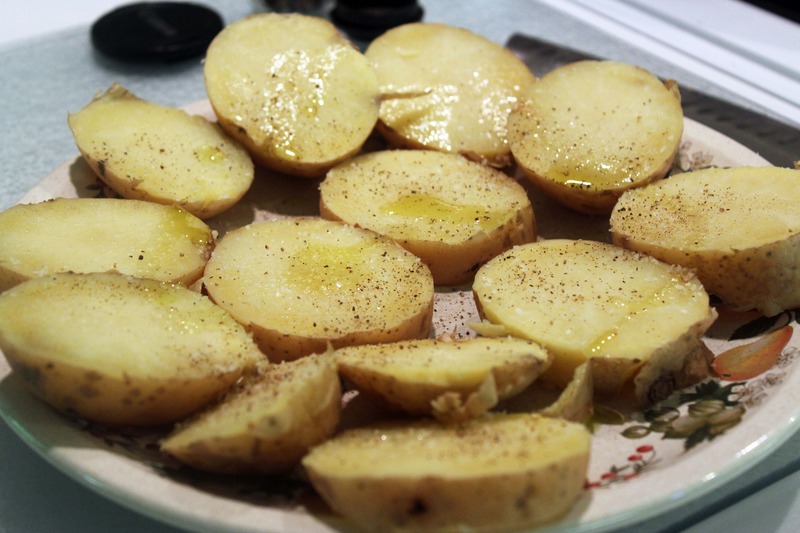 If you’re worried about the potatoes sticking you can drizzle them with olive oil, melted butter, or spray with cooking spray at this point. I went with olive oil since I was using a strange grill. And, it was a really great excuse to use TWO fats on an otherwise healthy starchy vegetable, instead of just one! Go big or go home, that’s what I always say about fatty flavorings. Melt some butter into a bowl, and take it with you to the grill. Grill the potatoes on each side for 5 minutes or so. Brush them with the butter as you go, and turn them once so that you get really good grill marks. And that’s it! So simple, yet SO delicious. Perfect with BBQ chicken or steak with chimichurri or your favorite grilled meal! Those look fantastic. They get such a great colour!